Under the direction of Matthew K. Gold, and in collaboration with designer Mark Abrams and developer Zachary Davis, Digital Fellow Micki Kaufman is working on the interactive, social reading platform for Gold’s edited collection, Debates in the Digital Humanities. Published in print by the University of Minnesota Press in 2012, the site extends these debates and discussions as an open access webtext that allows users not only to annotate and highlight the text, but also to share those points of interest with the broader digital humanities community. The site has been cited as an innovative model for future of the book in a digital format. Debates in the Digital Humanities brings together leading figures in the field to explore its theories, methods, and practices and to clarify its multiple possibilities and tensions. 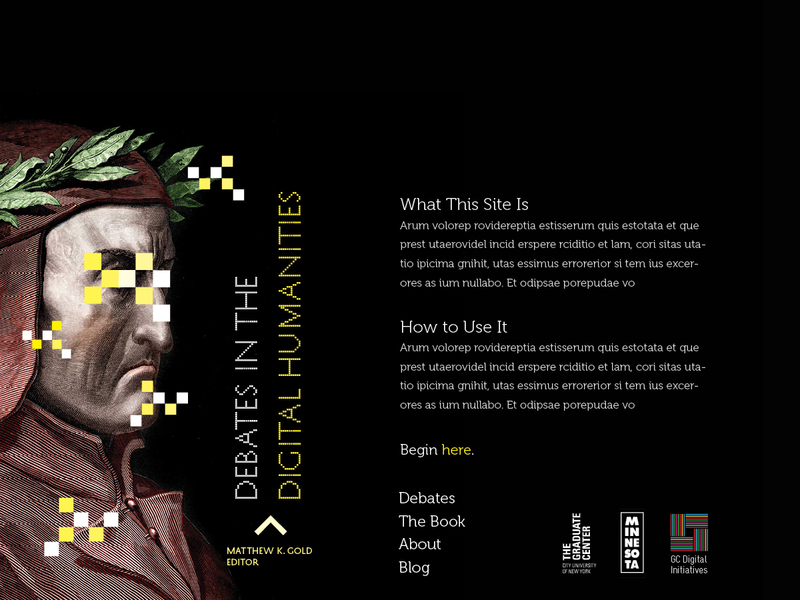 Published in January 2013, the open-access edition of Debates in the Digital Humanities marked not just the opening up of the printed text, but also the debut of a custom-built social reading platform. Going beyond the basic task of making the contents of the printed edition accessible, the OA platform makes the text interactive, with key features that allow readers to interact with the text by marking passages as interesting and adding terms to a crowdsourced index. Debates in the Digital Humanities is being expanded twice in 2013 so that the collection will remain current and continue to track new debates in the field. For more on the OA Expanded edition, please see our related post on the News page and please stay tuned for a forthcoming CFP.